Halifax coach Richard Marshall looks likely to reshuffle his side ahead of Sunday’s crucial third-versus-fourth Championship fixture against Sheffield at Doncaster (4.15). Marshall will have loan signing Danny Craven, the Widnes half back or full back, available for the first time, while another ball player, Ben Johnston, could return. “I think positionally, we will change things around a little bit this weekend, maybe spring a few surprises,” said Marshall, who said forward Adam Robinson remained only a “50/50” chance with a wrist injury. “I think we’re likely to have a new combination at half back, for starters. “Ben’s had a full week of training after recovering from his concussion, so he’ll be contention to play some part. “Danny has looked good this week; he’s a full time Super League athlete so he’s looked sharp, and he offers a running threat with the ball, so he’ll probably be involved in some capacity as well. “It’s a big game, and it’s probably one we’d have targeted at the start of the year as an important fixture. As ever, a key battleground against Mark Aston’s side will be Fax’s right side, where the Eagles’ attack will pitch Papua New Guinea giant Menzie Yere against the in-form Ben Heaton. 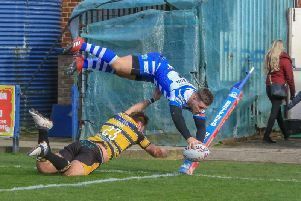 “I think in general, our defence, particularly on the goalline, needs to be a whole lot better than it was at Wakefield last Friday,” said Marshall. “By the standards we have set ourselves, we missed enough tackles in that game for the next three weeks. “Their left side is obviously very strong, with Yere, Kyle Briggs and QLT out the back. “You know what Yere is going to try and do, but knowing it and doing something about it are two different things. “Ben’s playing very well though; the try he scored at Wakefield last Friday was absolutely top class. “I like the way he goes about his business and he’s probably our most improved player this year, along with Ben Kaye. “I offered him the chance to go out on loan earlier in the season when he wasn’t getting in the side and he said ‘No’. “He told me ‘I’ll wait for my chance and when I get in, you’ll pick me every week’.